Formerly called Northern Long-eared bat. As its former name implies, their long ears make up 1/5 of their total body length. This bat is typically 8 cm in length and weighs 5-10 g.
Their fur is dull brown. They emerge just after the sun sets in order to hunt their prey along forest edges, over forest clearings, at treetop level, and occasionally over ponds. They also hunt again before dawn. Their preferred prey include caddisflies, beetles, moths, leafhoppers, and flies. 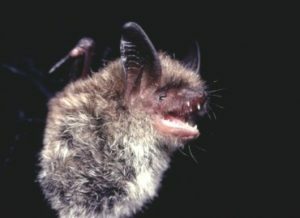 As early as September, northern myotis migrate to caves to hibernate and emerge as late as May depending on their location. Females give birth to one pup each summer and often form large maternity colonies (30-60 individuals) consisting mainly of females and their young. They usually choose hollow trees as maternal sites. Northern myotis are typically associated with wooded areas. WNS is expanding in Canada at average rate range of 200-400km/yr. If the spread of WNS continues at the current rate, the entire Canadian population would likely be impacted within 11-22 years. Please report any unusual bat activity such as flying outside in daytime or deaths to the Ministry of the Environment, Conservation and Parks at 800-667-1940.